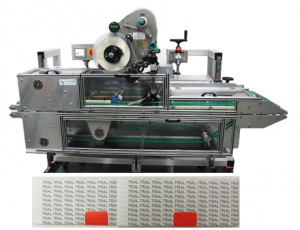 When approached by a blue chip packaging solutions company to supply a new generation of machine to label and seal folded leaflets, Sessions UK designed and built two systems exactly to customer specification. With key emphasis on versatility, easy setup and increased speed over existing equipment, Sessions UK provided a machine capable of labelling the full range of leaflets at speeds up to 15000 per hour and clear label placement accuracy within 1mm. Designed to fit in line with high speed leaflet folding machines, a simple height adjustment for different leaflet depths now ensures quick setup reduced from up to one hour down to 10 minutes. 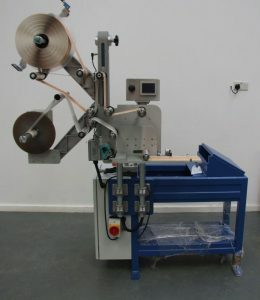 This huge reduction in downtime, faster output and digital touch screen control makes this unique Sessions UK machine the only choice for leaflet labelling. Sessions UK were requested by a leading quality car parts manufacturer to supply a semi-auto labelling system to print and apply labels to chassis components for luxury vehicles. The scope was to supply a machine that was easy to use, operator reactive, secure, safe and efficient in operation. After in-depth project discussions with our customer the design of the machine was agreed and manufacture begun. The machine was built and supplied to a tight two month schedule with all operation checked during build time and FAT test before delivery to site. Based around our LT80 print and apply system the machine was designed to apply labels to three types of shaped chassis components. A versatile jig system with product sensors was the key feature to simple operation without incorrect component being inserted. 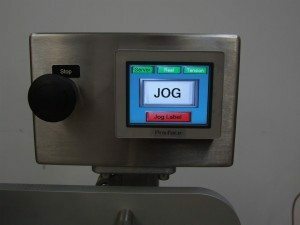 Using the interactive touchscreen display, the operator simply selected the correct component which automatically called the correct label design, then inserted the component into the jig. Prompted by the display, the component was pushed forward through safety light curtains to start the process and check the component type, if correct the label was automatically printed and applied to the product, scanned by a Datamatrix code reader and if all ok was removed from the jig through a pallet beam sensor to confirm completion of operation and count the components labelled. If at any point the process failed the system would lock out, alarm and wait for supervisor to reset by keycode operation. Sessions supplied a fully controlled, safe and efficient machine to exact customer specification. The machine works in an industrial environment with consistent reliable production output on a daily basis. Sessions UK were requested by a leading high level systems automation manufacturer to supply a semi-auto labelling system to apply special seal labels to medical components with high accuracy placement. The scope was to supply a machine that was easy to use, operator reactive, efficient in operation and incorporated into a product handling system. 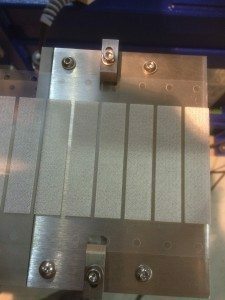 After in-depth project discussions with our customer a prototype was designed and tested to prove accuracy, final design of the machine was agreed and manufacture begun. Three machines were built and supplied to a tight three month schedule with all operation checked during build time, FAT test before delivery to site and incorporation into a special purpose handling system. 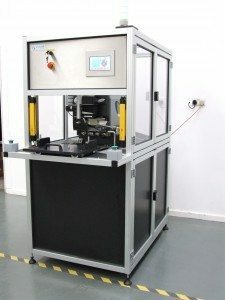 Based around our Pick and Place high precision label apply system the machine was designed to apply three types of special purpose seal labels to personal medical components. With a need for high precision application within +/- 0.2mm using non conventional thin surface labels the machine had to be developed to dispense the label material without faltering. 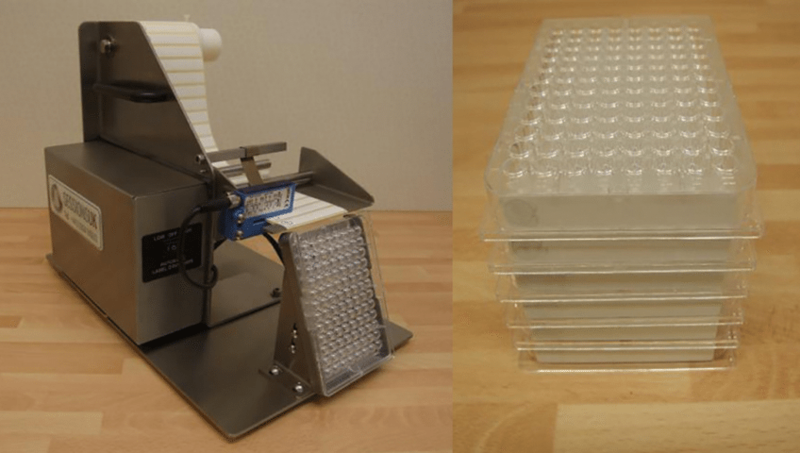 Three dispensing machines were supplied into each handling cell and each label was dispensed onto a waiting vacuum plate for application to the component by robot arm within the handling system. The key to success of this application was the constant tension unwind system giving high precision presentation of the label at the dispensing edge using linear electric motors. Sessions UK worked closely with our customer to provide another specialist label application. Sessions supplied a fully controlled, safe and efficient machine to exact customer specification. The machine works in a clean manufacturing environment with consistent reliable production output on a daily basis. Sessions UK recently supplied desktop electric dispensers to a pharmaceutical manufacturer to place pre-printed barcode labels to the ends of Microtiter trays. For a low cost, these semi automatic compact labelling machines at least doubled output and removed the awkward process of labelling trays by hand.